Sometimes far out isn’t far enough, but in the case of Dalston’s Café Oto you’ve gone way the hell out there, so far in fact that the mainstream’s just a haze. Heavily Japanese influenced, it’s a café, bar and all round excellent art and performance space and lo-fi celeb haven. We’ve lost count of the times Jarvis Cocker’s told us about how much he LOVED BBC 6 Music and Simon Callow’s tried to improve our Shakespearean acting. ‘To go or not to go?’ Go. The English and Japanese husband and wife team that who run Café OTO have established something of an avant-garde live scene in their Dalston space. Synth-punk, no-wave, and electronica: you will hear all music weird and wonderful at OTO. Operating with a similar raison d’être as its Dalston neighbour, the Vortex Jazz Club, Café Oto is all about innovation and experimentation. There is a regular line-up of live music and you can expect to hear anything from Baltic brass bands to British jazz in the Anglo/Japanese arts club. "one of Dalston’s most interesting destinations"
Café’s and bars can’t just be themselves anymore if they want to keep one step ahead of the crowd and Café Oto in Dalston is one of the new (yet old) breed of art and performance spaces supplementing themselves with events that rival established clubs and theatres. Tucked away on a side street just off the busy Dalston Junction, it couldn’t be more different from the chicken shops and brick-a-brack stalls just around the corner. It’s a vast space that celebrates the shady dimness that resides across the venue despite the large windows that form its façade. A small counter bar and kitchen room break off to one side while the rest of the warehouse like room is spattered with tables and chairs and a small collection of worn sofas. 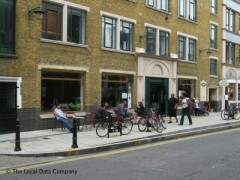 But what does Café Oto do for fun? Well, it hosts various hip events like magazine launches and similar exclusivity but there’s also live performances, bands and art shows, which make this one of Dalston’s most interesting destinations. Expect to find Hackneyists and stylish Dalstonites hanging out, mingling and fiddling on Macbooks during relaxed daytimes and atmospheric, buzzier evenings. The tiny kitchen serves simple sides of grilled cheese on toast and Japanese snacks along with Sierra Nevada and Asahi beers as well as offerings from The Kernel, a London based microbrewery.